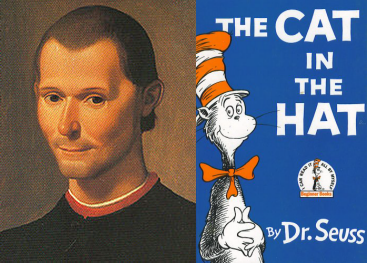 What do Machiavelli and Dr. Seuss have to do with Knowledge Mobilization? Concludero’ solo che al principe, e necessario avere ilpopolo amico – I will conclude then that it is necessary for the prince to have the people as friends. Lesson: No silo research. Research partnerships must be broad and most importantly, engage the people impacted by the outcome. ResearchImpact and a key community partner, the United Way of York Region recently published an article in Issue 22 (June 2009) of Research Global, the magazine of the Global Research Management Network published by the Association of Commonwealth Universities. All we could do was to sit, sit, sit. And we did not like it, not one little bit. Then something went bump. How that bump made us jump. Lesson: Enter all partnerships with an initial plan, a willingness to change depending on the circumstances and, when something goes bump, be present. Full commitment, engagement and openness are critical. If not, do not enter. The article titled “Lessons learned from knowledge mobilisation: turning research into action” is a whimsical look at 10 lessons learned from 3 years of growing Canada’s first institutional knowledge mobilization unit broadly serving the needs of university faculty, graduate students and their non academic research partners. Each lesson is inspired by and offered with apologies to either Niccolò di Bernardo dei Machiavelli’s The Prince or Dr. Seuss’ The Cat in the Hat and we back up each lesson with a real life example drawn from our own knowledge mobilization practice. Read the article and all 10 lessons here and see a PowerPoint presentation of the 10 lessons here. Excellent option to include the 10 lessos powerpoint presentation along with the article link. Indeed, some of the lessons/suggestions have a far broader scope of application even beyond KM. Taken from a personal interactive level, these lessons can be applied to social networking in general, as well as for effective knowledge mobilization. Pingback: Items of Interest to Ontario Community Groups and Especially those in York Region – Help with Social Media and Access to Infrastructure $$$ « Mobilize This! Pingback: GURU = Great University-Based Research Utilization « Mobilize This!